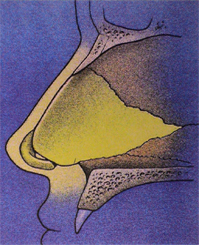 Surgery to reposition a deviated nasal septum is known as a septoplasty. This is performed under general anaesthetic through small incisions within the nose. Septal reconstruction using cartilage harvested from the ear and mucosal flaps to cover the graft occasionally requires an ‘open’ approach with a small incision crossing the skin between the nostrils. This incision tends to heal extremely well and is generally barely perceptible after a few weeks.